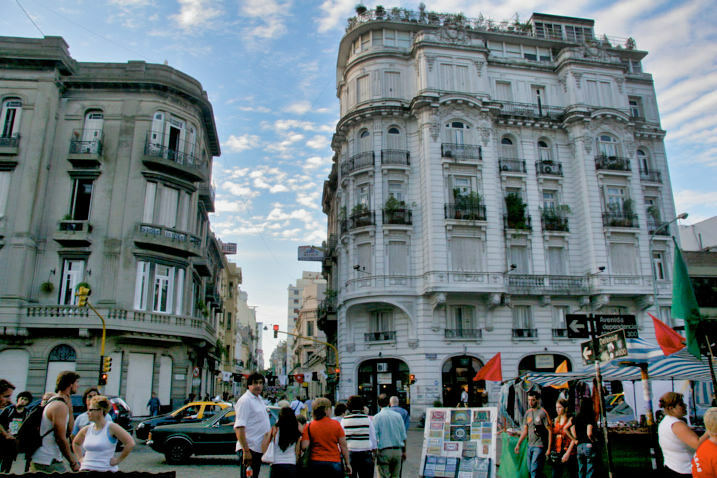 Every Sunday the historic and continually being restored colonial neighborhood of San Telmo ignites with street musicians, a bustling antique market around Plaza Borrego and real Tango shows in crowded pubs and cafés. But perhaps even more fun is coming here to watch the people who come to shop, walk, eat and drink. With several hours to kill before heading to a futbol (soccer) game between RiverPlate and Racing, Fernando guided us through the streets of San Telmo before finishing up with a typical “meat sandwich” so that we’d have the energy and attitude needed to take on an Argentinean futbol game. 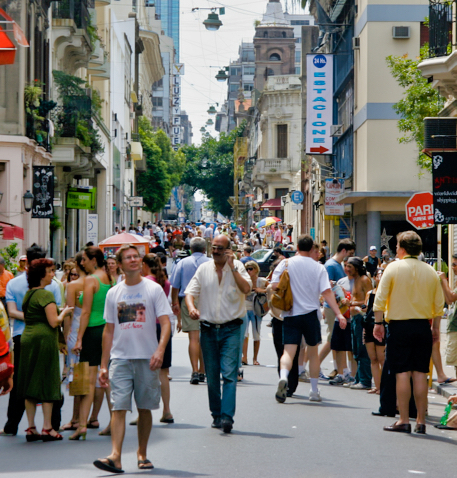 Sunday is a fest in San Telmo neighborhood of Buenos Aires. One of the older neghborhoods, the colonial architecture and well restored buildings make for a great Sunday afternoon walk. As the hours drifted past noon the streets were hot with energy and our bodies dripping with sweat. But this is still summer in Buenos Aires. 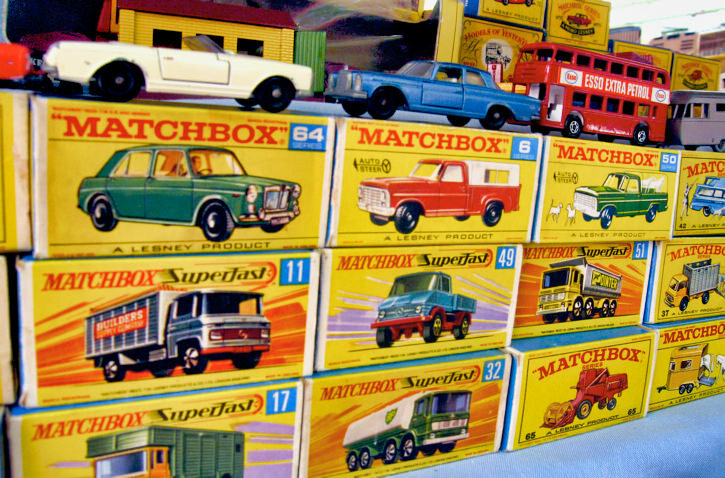 You can find the most interesting things at the antique market. 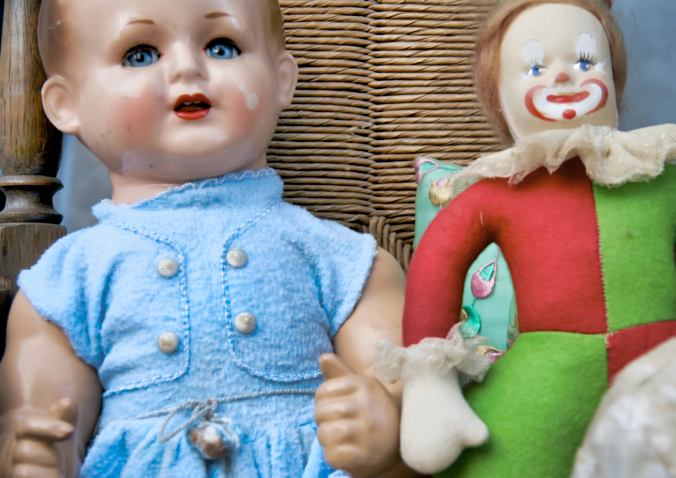 You can find some not so pretty things, too. 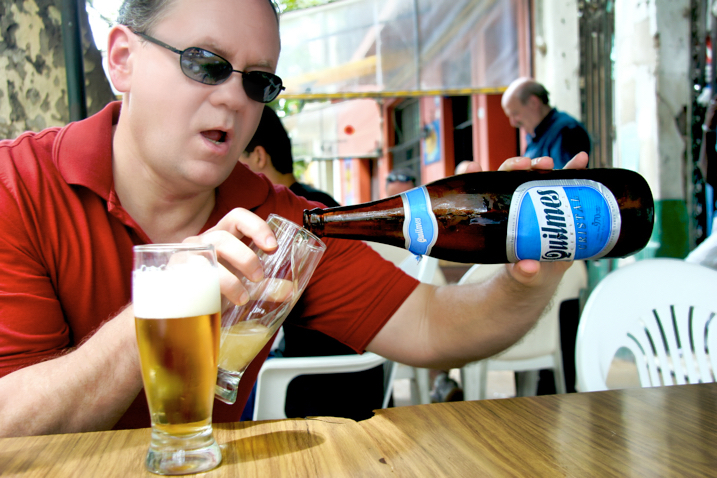 And when the heat gets you you simply grab a nice cold Quilmes or Iguana. 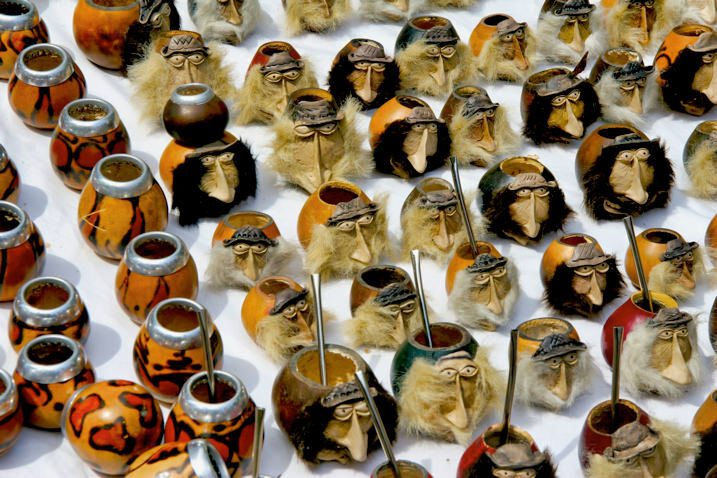 We haven’t discussed the Argentine passion for mate yet in this blog, but looking for a new mate cup? 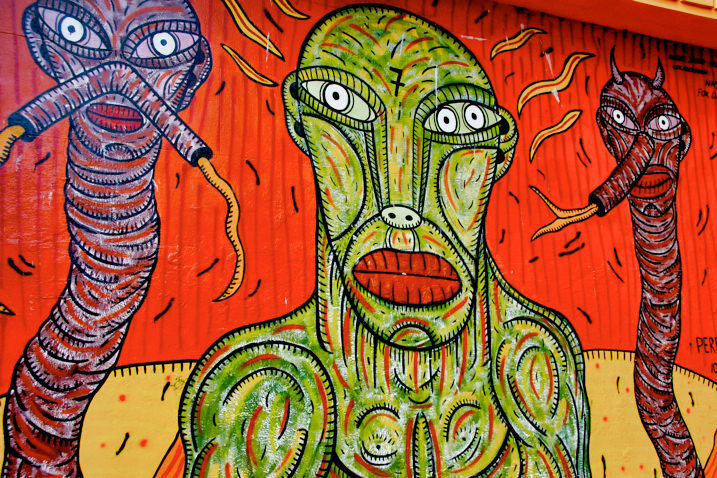 Find one in San Telmo. 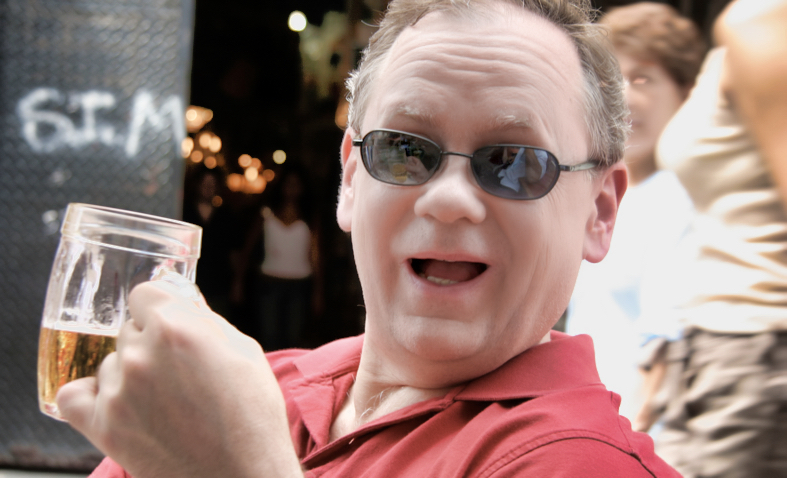 Fermando agrees that San Telmo is thumbs up. 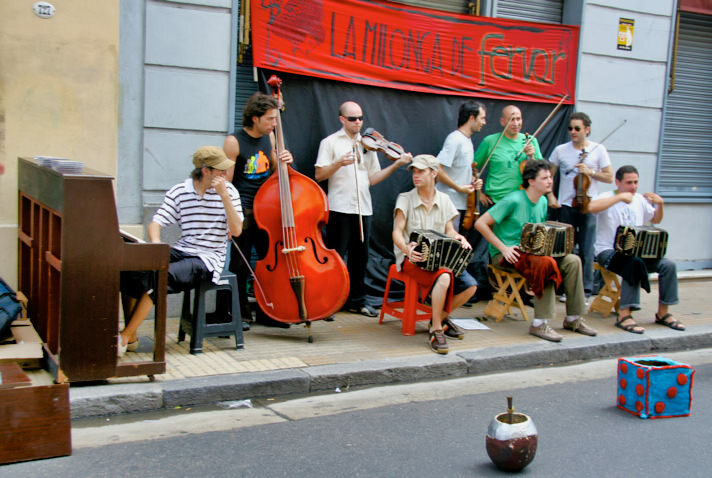 Full Tango Bands bring their instruments, Including pianos, out on the streets. Notice the extra large mate cup used as a tip jar. Tim shows this lady just how the Tango should be done. And I give this gal a bit of a lesson, too. 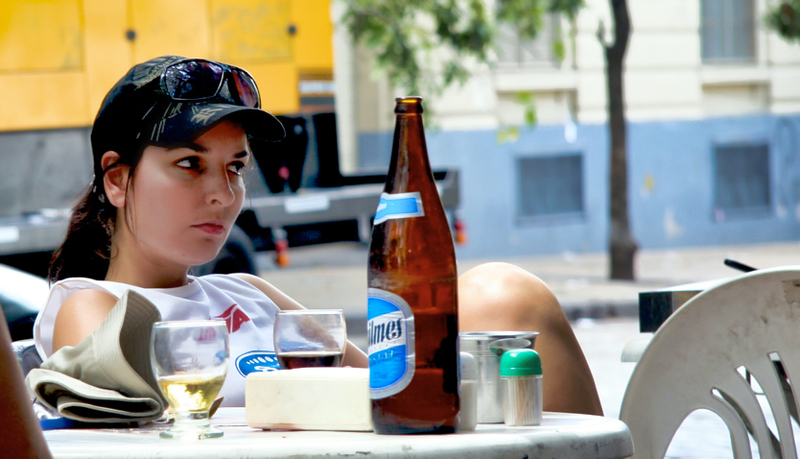 We’re not the only ones who enjoy a cold Quilmes on a Sunday; on anyday. The graffiti in the neighbor is of high caliber quality. 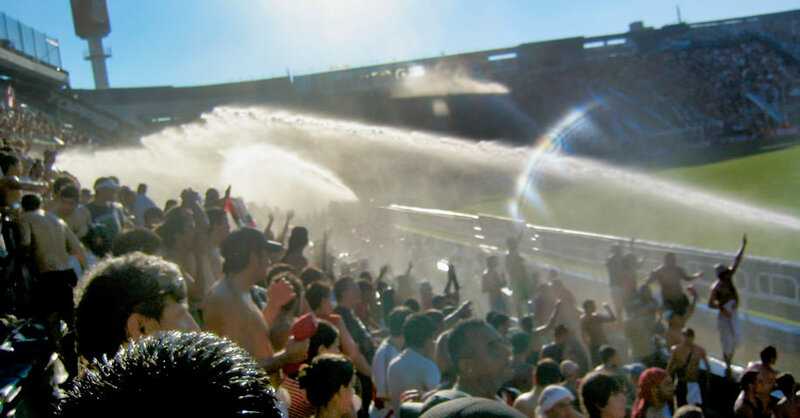 The blinding sun and pounding heat meant a scorching game of futbol on both the field and in the stands with the fanaticos. We had to park a kilometer or so from the stadium and that’s when I learned that no beer is solved within a kilometer or more radius from a futbol stadium on game day. 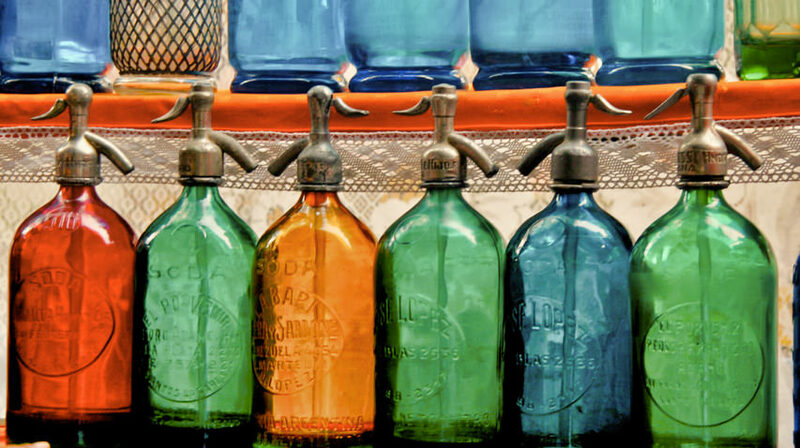 No kiosco, supermarket, convenience store – no body – can sell any alcohol. Even though we had reserved tickets, all 20,000 or 30,000 fans were funneled into a single entrance. The line tailed down the street a block from the stadium. The closer we got to the entrance and security the tighter packed we got and the harder the crowd pushed. With my backpack slung to the front over my chest and held onto my things. Fernando did his best to keep Tim and I within arms reach, but this became difficult as the crowd carried us independent. I was a gringo island in an ocean of RiverPlate fans who on cue would sing, shout and wave huge flags while I was pushed closer to the entrance. At one point the crowd heaved stronger than a Patagonian wind gust and picked my up off the ground. I was airborne with my feet dangling as the crowd moved closer to the entrance. I tried to break loose but for more than 30 seconds I couldn’t put my feet on the ground. It was the scariest feeling I’ve ever had during this trip. My mind raced back in history to stories of people getting trampled to death such as the 30 odd fans of the rock group “The Who” who saw their lives end while trying to see a simple concert. 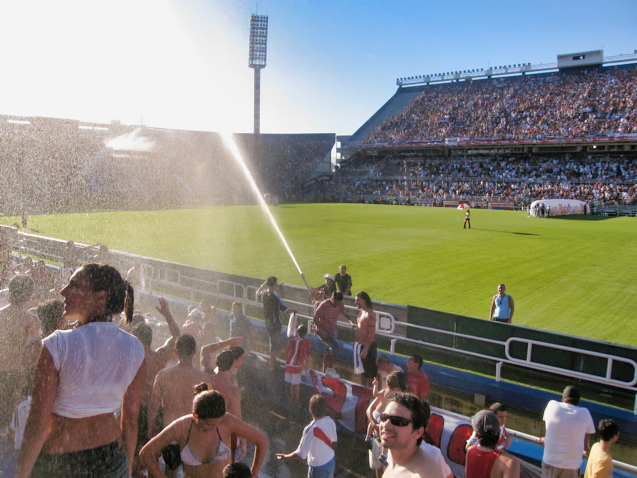 Here I was in Argentina on my way to a futbol game. Almost an hour later sitting in the stands with the sun beating down on my pale skin, I reflected back to my “out of body” experience while in line trying to get in and wouldn’t exchange the experience for a minute. Amazing. The stadium roared with thundering feet pounding the concrete. There were no seats in the stadium. Just concrete steps. At opposite sides of the goals (end zones) the completing fans in the public (publico) sections waved banners. My hosts today ensured I was a RiverPlate fan. While at the opposite end of the field the passionate Racing fans with their blue and white team logo we’re extremely coordinated with each holding a square two-sided (blue/white) placards while others sported long ribbons that stretched for 50 people long. In perfect time and while chanting songs they would hide and reveal their team flag almost the width of the seating section. During the game the synchronicity of these fans and their passion amazed me — especially since they haven’t won a championship in more than 30 years. The River fans were no less passionate, though no where near as coordinated. 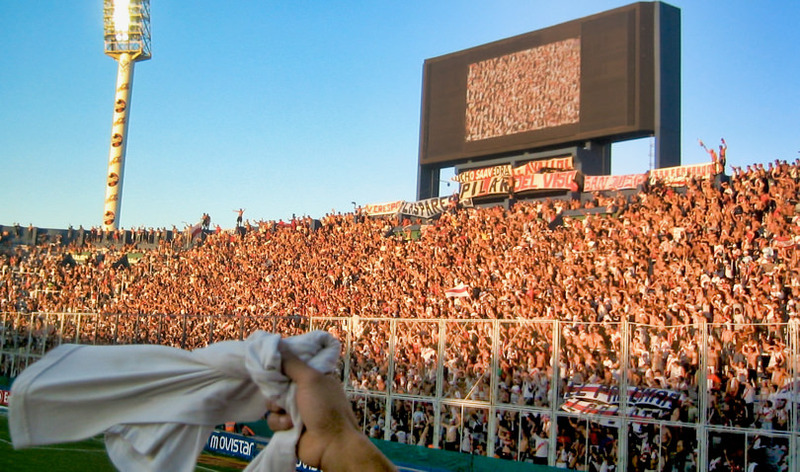 During the entire game a group of fans held a series of banners that were tied to each other like a long train that wrapped around half the stadium. Somehow we ended up sitting just a few rows behind this chain which often blocked my view of the field. But I wasn’t going to be the one to ask them to put it down. During half-time the crowd continued to roar and sing songs. I mouthed along just wish I understood the slang and jokes of these songs. Fernando did his best to try to translate. But I’m sure you have to live this life to really get it. All during the game I noticed two large nozzles or water cannons mounted on the sidelines. I knew these weren’t necessarily just simple fire protection devices. No. I imagined they were crowd control devices should the fans get out of hand. But with shirts off and the beating sun, the fireman today decided it might be a good idea to cool off the crowd. It started off tame as they pointed the nozzles skyward and let the water rain over the crowd. But the more wet they got, the crowd became more demanding. So the fireman began to have fun and increased the pressure and hosed the crowd point blank arching the entire width of the stadium. I was soaked head to toe. While always keeping my camera at bay, I did my best to shield it from the harmful wetness of the fire hose. Later while joining some of Fernando’s friends for home made pizza and a wine tasting, I realized that my Canon S80 point and shoot became a victim of a RiverPlate futbol game. The LDC screen was shot. No longer would it light. Very sad for me, as this camera shoots the bulk of my WorldRider photos that you see on these pages. Racing fans roll out their bandera (flag) just to show their passion. You’re serious about your team when you have the team logo tatooed on your arm. Things started out pretty tame. Just cool off the crowd. But this is life and these experiences enrich it now matter how costly or temporarily frustrating they can me. It’s rare, but we saw six goals during Sunday’s game. My team one, 4-2. While getting out of the stadium was easier than getting in, we had to wait 45 minutes until the fans of Racing had left the stadium and were a good distance away from the stadium — another custom I was dumfounded by. You’d never see that happen in the United States. But then again, sports fans no matter how passionate they may seem in the U.S. they’re nothing like Soccer fans here in South America.